Lately I’m becoming friends with potatoes. I almost never eat potatoes and the reason is because I have enough carbs in my diet as a vegetarian. I’m usually trying to integrate more leafy greens and complete protein balance. But lately, I’ve been suuuuuch a good girl and eating everything a doctor would want me to eat that I say hey, let me live a little and eat a potato. Look at me. Living on the edge. In lieu of bungee jumping, I eat a potato. Can you hear my heart rate climbing? Two years ago, my sister and I took a trip together. We never get a “sister weekend”, so what do we do? Should we go to mexico for a beachy vacation or should we go to NYC for a shopping trip? Neither. We went to a food bloggers camp. ‘Cuz that’s how we roll. Food nerd fun. And it was so fun because you get to meet a bunch of people that are JUST as nerdy as you! We roll up to Camp Blogaway in a red convertible rental. We are the first to stuff camping gear in a convertible, I’m sure. Well, not 59. 58. My sister couldn’t quite make it to the potato event. She was sleep deprived all week with her 3 year old and 5 year old girls and her body simply could not defy gravity to wake up that morning. When she finally awoke and arrived in the main hall, the rest of us were cleaning up, washing her hands, and getting some morning tea/coffee. And for her, it was a “glasses day”. Contact lenses are on the back burner this morning. If I recall correctly, it even took a good 4 minutes before she was able to utter/slur “good morning”. Then we stood in line for breakfast. We use our rare sister weekends to have really intelligent conversations. A Hasselhoff potato is quite elegant in presentation. You can be having a “glasses day” and still be able to execute it well. It’s just a potato cut into little slivers, but you don’t cut it all the way through because you want the layers to “fan” out. The trick I learned at Camp Blogaway is to lay the potato between horizontal chopsticks to ensure you won’t accidentally cut the potato all the way through. 2. Slicing the potatoes: You want to be sure not to cut the potato all the way through because you want the potato to remain intact, as one body once you are done. The chopsticks are a clever “stop” to keep you from cutting all the way through, but you have to be extra careful on the two ends. Starting from one end and working your way to the other, cut the potato (shortways or “crossways”). Cuts should be only a few millimeters apart. 3. Preheat the oven to 400F. Place potatoes on parchment paper on a baking sheet. If using garlic slices, insert each one between layers, randomly. This step is analogous to installing braces so I suspect that it’s really easy for dentist and orthodontists. Don’t insert the garlic slices too far inside – just beneath the skin is fine. The garlic slices do two things: (a) separates the layers and (b) adds garlic flavor to each bite! I like to have a garlic slices between every single layer! 5. Season generously with sea salt, pepper, and chopped herbs. 6. Bake for 50 min to 1 hour, or until edges of each layer are brown/crisp and potato flesh is tender. 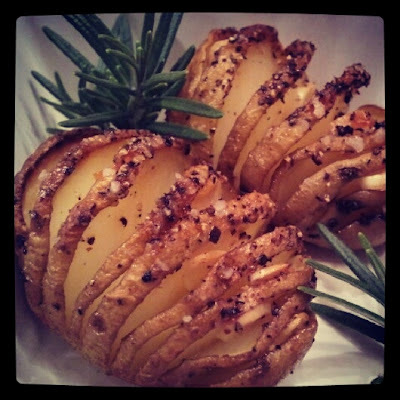 You can do this with mini potatoes like new potatoes or any of the bite-size potatoes, but scale down on the other ingredients, since the potatoes are much smaller. Entertaining: Patio Brunch IV – Tex-Mex Style!